Finally, after years of crisis, it seems that the industry is reviving. 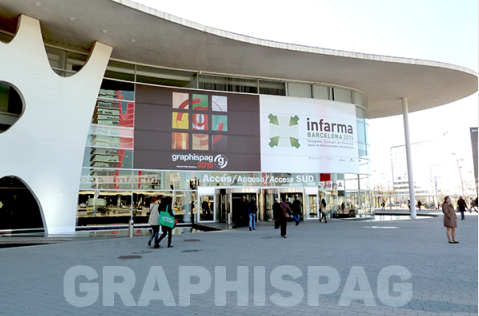 Graphispag, the leading graphic arts exhibition for the Iberian Peninsula, welcomed around 20,000 professionals visiting over 200 exhibitors in Barcelona. Quite remarkable seen the uncertainty prior to the event due to the lack of some iconic brands and the weak performance of the previous edition two years ago during the crisis. Fortunately the market realised the importance of Graphispag and this has caused a large influx of attendees. Remains to be seen whether these visits turn into business for exhibitors, but what is certain is that the pessimism seems to have gone away. Sectors such as large format, labels, textile printing and 3D printing have been well represented, while other areas like offset were almost entirely absent. This is not surprising as there is oversupply of offset printing equipment in Spain and in the last seven years 40% of graphic arts companies disappeared. Companies no longer use fairs as a platform for product launches. Nevertheless Graphispag wanted to demonstrate novel applications and their added value to printers – especially for new sectors like decoration, textile, advertising, fashion or packaging. All these applications were shown in two areas: The Print All Print Experience and Innovation Zone. Furthermore the event organisers wanted to promote networking among professionals by offering speed dating to expand business networks. This approach, along with a full programme of conferences with a dozen daily sessions in the Conference Corner Print, revalued the event which will celebrate its 50th anniversary next year and reconvene the sector in 2017. But despite the success and the good atmosphere this edition of Graphispag will be remembered for the tragic plane crash on the first day of the fair. 150 people flying from Barcelona to Düsseldorf died in the French Alps. It came as a shock to everyone attending the event, since it is a flight that departs from Barcelona, and everyone working in the graphics sector takes this regularly for industry trade events. Our sincere condolences to all families, colleagues and friends of the victims. CHILI Publish presented its advantages as online editing software documents on the stand of its SS & C dealer. Enfocus unveiled its Switch automation solution that allows processes to take full advantage of investments in software and minimize manual processes and also showed the capabilities of PitStop Server. Esko showed its software for packaging managing, artwork creation, structural design, pre-production, 3D visualization, workflow automation, quality control and collaboration in the supply chain, as well as handling systems and finishing Kongsberg. Mimaki presented the CJV150 with printing and cutting integrated into the Digidelta booth. Xeikon introduced its new digital color printer based on dry toner Xeikon 9800.